Japanese Episode DP 012: "Contest Battle! Rival Showdown!!" American Episode 476: "Arrival Of A Rival!" The eight Coordinators eligible to compete in the next round are announced, and Hikari, Satoshi, Nozomi, and Candy Musalina all make it! After a random shuffle, it is decided that the first battle will be between Satoshi and Nozomi! Nozomi is eager to battle until she learns that Satoshi is also competing in the Shinou League. She believes that a person cannot do both Contests and Gym Battles and looks down on Satoshi as someone who's only in the Contest as a hobby. Nozomi takes this attitude with her to the battle field, where her Nyaruma is able to defeat Satoshi's Aipom with a pretty big advantage. 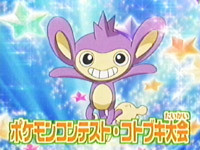 When the battle ends, Nozomi learns that Satoshi only entered the Contest because Aipom wanted to, so she throws out the idea of having Hikari train Aipom instead! The second round continues until Hikari and Nozomi are pitted against each other. Hikari's Mimirol seems to have the upper hand when it turns the floor into a sheet of ice with its Ice Beam attack, but Nozomi's resourcefulness enables her to use her surroundings to her advantage. The five minute time limit runs out, and Nozomi is declared the winner! After receiving some tough love from her mother, Hikari watches Nozomi face off against Candy Musalina in the final battle. Despite Muscippa's early lead, Nyaruma proves to be the stronger pokemon and knocks its opponent out! Nozomi has won the Kotobuki Convention and earns herself a second Contest Ribbon! Later that night, Hikari bids her new rival farewell and vows to become as great as she is someday. With the Contest now over, our heroes focus on Satoshi and his goal to earn his first Shinou League Gym Badge. So the first Super Contest comes to a close, and Hikari's first Contest went better than Haruka's first Contest even though the outcome was the same. Hikari and Mimirol put up a really good fight, and my only fear with this Coordinator is that she'll win a lot of her ribbons through ridiculously unbelievable means the way Haruka did. It was also nice to see Satoshi lose his match and to see Musashi get farther along than both our heroes did. Could this be a sign that Musashi may actually win a Ribbon in this region? Let's hope so. The dubbed version is really unremarkable. We get a nice piece of Johto background music from the Japanese version, but everything else is the same as it always is.